iSCSI Initiator problem -Initiator Instance Does Not Exist. Initiator Instance Does Not Exist. Resolution was to uninstall the Microsoft iSCSI Initiator storage controller from device manage and install it again. 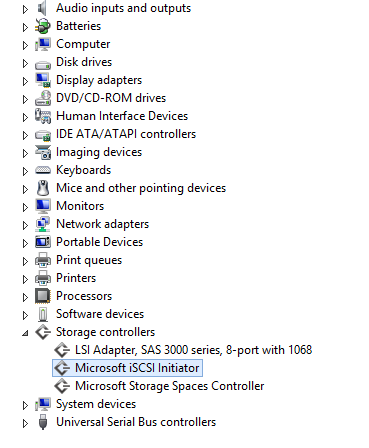 Right Click Microsoft iSCSI Initiator and click Uninstall. Right click the computer name and click Add legacy hardware. Select “Install the hardware that I manually select from the list (Advanced). Click Next. Select Storage Controllers from the hardware types list. Select Microsoft as Manufacturer and Microsoft iSCSI Initiator as Model. Click Next twice. and wait the device to install. Use the iSCSI Initiator to connect to your iSCSI Target. Recently I run out of free space on one of my XPenology DSM 6 drives and had to run an extend. So it was obvious manual resize through SSH is necessary. After some time spend on googling good articles for doing this, the best one i found was http://blog.azib.net/2013/12/how-i-upgraded-my-synology-nas-to.html. It explains quite well the overall process of manually extend the volume (extend the vmware disk partition, the MD device, the physical, virtual and logical LVM volumes) , however I found Step 1 from the guide as dangerous (the partition recreation with a larger one) so I decided to try the parted partition resize option instead. Extend the Disk in the VMware VM and connect to Synology using SSH (sudo su as needed). In my case only samba was using the drive and it was stopped by /usr/syno/etc.defaults/rc.sysv/S80samba.sh stop .Follow Anton’s guide since it’s more detailed on how to find & stop the service using the drives, especially if you work with the volume where Synology packages are installed – usually volume1. lsof | grep volume3 <– run it again to ensure nothing remains using the volume. At this stage I expected the Synology GUI to reflect the actual RAID group and volume size, but it wasn’t the case. After a Reboot (which starts the stopped services as well) the RAID group started showing the correct size after the extension. The Volume was still with the old size, but the GUI was handy (Login in Synology–>Storage Manager –>Volume –>select volume 3 –>expand) and the volume was extended, which ended the procedure. ALWAYS BACKUP YOUR DATA FIRST! Recently I had to deploy XenServer 6.X on my Hyper-V LAB on Windows Server 2012 R2 to evaluate a monitoring solution with 3rd party MS SCOM management pack. The deployment was expected to be straightforward based on experience I have from other Linux distributions and VMware ESX. However during boot time XenServer was always hanging on “Detecting Hardware.”. Most of the articles over Internet says to disable ACPI, despite in XenServer 6.X the native safe mode has already that option turned on as well as others compatibility settings like noirqbalance, noapic, etc. Magento (https://magento.com/) is one of the top 3 Open Source ecommerce platforms. Designed to run on Linux & Apache it could be a challenge to get it running on Windows IIS right from the first time since officially Magento is not supported on IIS. 3. Install php (5.5.x, 5.6.x or 7.0.2) http://devdocs.magento.com/guides/v2.0/install-gde/system-requirements.html and enable the required PHP modules as per the official magento documentation. You can use the URL-rewrite IIS settings to import .htaccess URL rewrite rules (URL Rewrite–>Import Rules–>Browse the file and select Import–>remove the non-convertable settings and click apply. In case PHP Temp directory is not specified in php.ini then PHP takes the folder in the TEMP Environment variable (C:\Windows\Temp by default). 9. Setup SSL on you IIS website – a lot of content exist on Internet how to do this. It doesn’t matter if you do this before or after the Magento Installation. It’s important to avoid using self-signed certificate. When you install from the website the Magento installation may hang on (freeze on) Installing schema.. or Upgrading schema.. usually around 4% or 5%. Luckily the default state of the Auto DoS feature on the HP V1810 switches is disabled. And you should always leave it like this. It’s one of the worse implemented features ever seen on a managed switch. The idea for additional L2 security layer is good, however the realization is definitely poor. With the basic enabled/disabled states and zero customization available, the features set goes into the recycle bin. In particular it blocks all NetBIOS traffic over the LAN due to the “nice” feature called “Prevent UDP Blat Attack”. It seems HP engineers are not aware NetBIOS use the same UDP Port 138 or maybe they believe it’s rarely used protocol nowadays. – Error 0x54b(1355 in decimal) present in %windir%\debug\NetSetup.log during PC join attempts. Clearly reading the full vendor documentation before deploying any new equipment is a must. Otherwise you can spend hours in troubleshooting to understand how a single check box affects your Active Directory environment. Reference: Auto Dos features description. Enable – Select to prevent receiving packets from the all attacks mentioned below (Default: Disabled). Prevent Land Attack – Prevents receiving packets with matching Source and Destination IP addresses. Prevent Ping Of Death Attack – Prevents receiving ping packets with a size larger than 512 bytes through the use of fragments, which can target vulnerable systems. Prevent Invalid TCP Flags Attack – Prevents receiving packets with invalid TCP flags. TCP Flag SYN set and Source Port less than 1024 or TCP Control Flags = 0 and TCP Sequence Number = 0 or TCP Flags FIN, URG, and PSH set and TCP Sequence Number = 0 or TCP Flags SYN and FIN set. Prevent TCP Fragment Attack – Drop IP Packets that have a TCP header less than 20 bytes. Prevent Smurf Attack – ICMP Echo packets (ping) to a broadcast IP address are dropped. Prevent Ping Flood Attack – Prevents Ping Flood by limiting the number of ICMP Ping packets. The rate is 1000 ICMP packets per second. Prevent Syn Flood Attack – A SYN flood attack sends TCP connections requests faster than a machine can process them. Setting this filter limits the rate of TCP connection requests. A few weeks ago after an in-place upgrade from Windows 2012 to 2012 R2 Hyper-V started behaving poorly, especially during the VMs power on. All of them were spending abnormal duration on “Starting (10%)” phase – at least several seconds. Quite annoying problem which definitely required resolution as on the same box with win2k8 R2 Hyper-V worked like a charm – a VM used to power on in less than a second. After troubleshooting through drivers compatibility and processor performance counters the root cause was found in the enabled Intel C-State Tech feature in BIOS. Disabling this power saving feature returned back the expected performance of Hyper-V.